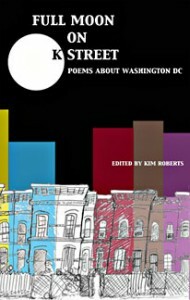 Full Moon on K Street: Poems About Washington, DC, ed. Kim Roberts. Published in conjunction with the tenth anniversary of Beltway Poetry Quarterly. Contributors: Karren L. Alenier, Elizabeth Alexander, Kwame Alexander, Abdul Ali, Francisco Aragón, Naomi Ayala, Jonetta Rose Barras, Holly Bass, Paulette Beete, Reginald Dwayne Betts, Derrick Weston Brown, Sterling A. Brown, Sarah Browning, Regie Cabico, Kenneth Carroll, Grace Cavalieri, William Claire, Carleasa Coates, Jane Alberdeston Coralín, Ed Cox, Teri Ellen Cross, Ramola D, Kyle Dargan, Ann Darr, Tina Darragh, Christina Daub, Hayes Davis, Thulani Davis, Donna Denizé, Joel Dias-Porter, Tim Dlugos, Thomas Sayers Ellis, Roland Flint, Sunil Freeman, Deirdre Gantt, David Gewanter, Brian Gilmore, Robert L. Giron, Barbara Goldberg, Patricia Gray, Michael Gushue, Daniel Gutstein, O.B. Hardison, Jr., Essex Hemphill, Randall Horton, Natalie E. Illlum, Esther Iverem, Gray Jacobik, Brandon D. Johnson, Percy E. Johnston, Jr., Fred Joiner, Beth Joselow, Alan King, Michael Lally, Mary Ann Larkin, Merrill Leffler, Toni Asante Lightfoot, Saundra Rose Maley, David McAleavey, Richard McCann, Eugene J. McCarthy, Judith McCombs, Tony Medina, E. Ethelbert Miller, May Miller, Samuel Miranda, Miles David Moore, Yvette Neisser Moreno, Kathi Morrison-Taylor, Gaston Neal, Jose Emilio Pacheco, Jose Padua, Michelle Parkerson, Betty Parry, Linda Pastan, Richard Peabody, Adam Pellegrini, Elizabeth Poliner, Minnie Bruce Pratt, Liam Rector, Joan Retallack, Katy Richey, Joseph Ross, Ken Rumble, Robert Sargent, Gregg Shapiro, Myra Sklarew, Rod Smith, Alan Spears, Sharan Strange, A.B. Spellman, Hilary Tham, Maureen Thorson, Venus Thrash, Dan Vera, Rebecca Villarreal, Belle Waring, Joshua Weiner, Reed Whittemore, Terence Winch, Ahmos Zu-Bolton II. (Plan B Press, 2010). 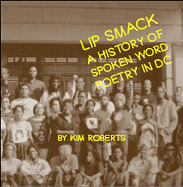 Lip Smack: A History of Spoken Word Poetry in DC by Kim Roberts. Published in conjunction with the tenth anniversary of Beltway Poetry Quarterly. A timeline of major spoken word events in Washington, DC from 1991 to 2010. Published in partnership with The Word Works, Inc. and the Humanities Council of Washington, DC. Nonfiction chapbook. Out of print; limited availability from Beltway Editions for $10. Titles in RED are the editor’s picks for the Ten Best Books (and Two Anthologies) of 2018. NOTE: Beltway Poetry Quarterly‘s selections for the Ten Best Books of 2017 Plus Four Best Anthologies are listed in red. The Golden Shovel Anthology: New Poems Honoring Gwendolyn Brooks, ed. Peter Kahn, Ravi Shankar, and Patricia Smith. Contributors include: Kim Addonizio, Sandra Beasley, Teri Ellen Cross Davis, Kyle G. Dargan, Rita Dove, Calvin Forbes, Nikki Giovanni, Yona Harvey, Randall Horton, A. Van Jordan, Maxine Kumin, Hailey Leithauser, Philip Levine, Toni Asante Lightfoot, Erika Meitner, E. Ethelbert Miller, Gregory Pardlo, Linda Pastan, Myra Sklarew, Lisa Russ Spaar. (anthology, University of Arkansas Press). Susan Thornton Hobby: Conversations, Little Patuxent Review Books. E-book of interviews with Lucille Clifton, Alice McDermott, Martín Espada, and Jane Hirschfield. NOTE: Titles listed in red are Beltway Poetry Quarterly‘s picks for the Ten Best Books of 2016. We have highlighted two additional Best Anthologies of the Year. Monticello in Mind: Fifty Contemporary Poets on Jefferson, ed. Lisa Russ Spaar. Contributors include: Jennifer Chang, Lucille Clifton, Michael Collier, Stephen Cushman, Rita Dove, Claudia Emerson, Thorpe Moeckel, Ravi Shankar, R.T. Smith, Natasha Trethewey (anthology, University of Virginia Press). The Orison Anthology, Vol. 1, 2016, ed. Luke Hawkins, Nathan Poole, and Karen Tucker. Includes Beltway Poetry Quarterly’s nomination, “Kingdom of Heaven” by Katherine E. Young, as well as work by Shevaun Brannigan, Rachel Eliza Griffiths, Vandana Khanna, and Bruno Nelson. Other nominating journals include The American Scholar and 32 Poems. Unrequited: An Anthology of Love Poems to Inanimate Objects, ed. Kelly Ann Jacobson. Contributors include: Isaac James Baker, Jacquelyn Bengfort, Melanie Bikowski, Sass Brown, Danielle Evennou, Kate Horowitz, Jacqueline Jules, Sarah Lilius, Gregory Luce, Neelam Patel, Ed Perlman, Julia Rocchi, Terrence Sykes, Pamela Murray Winters (anthology, CreateSpace). Veils, Halos & Shackles: International Poetry on the Oppression and Empowerment of Women, ed. Charles Adès Fishman and Smita Sahay. Contributors include: Ned Balbo, Roberta Beary, Jehanne Dubrow, Meg Eden, Barbara Goldberg, John Guzlowski, Linda Pastan, Jane Satterfield, Ravi Shankar, Myra Sklarew, Naomi Thiers (anthology, Kasva Press). NOTE: Titles listed in red are Beltway Poetry Quarterly‘s picks for the Ten Best Books of 2015. We have highlighted two additional Best Anthologies of the Year. Clash By Night, ed. Gregg Wilhelm and Gerry LaFemina. Contributors include: Ned Balbo, CL Bledsoe, Donald Illich, Richard Peabody, Jane Satterfield, Ravi Shankar, Dean Bartoli Smith. (anthology, CityLit Press). Note: Titles listed in red are Beltway Poetrys selections for Best Books of 2014. Note: Titles listed in red are Beltway Poetry‘s top picks for Best Books of 2013. Women Write Resistance: Poets Resist Violence, ed. Laura Madeline Wiseman. Contributors include: Kimberly L. Becker, Carol Quinn, Rosemary Winslow, Jane Satterfield, Carly Sachs. (anthology, Hyacinth Girl Press). Amazing Graces: Yet Another Collection of Fiction by Washington Area Women, ed. Richard Peabody. Contributors include: Jonetta Rose Barras, Verlyn Flieger, Alssandra Gelmi, Esther Iverem, Kim Roberts, Katherine R. Smith, Amber Sparks. (short fiction anthology, Paycock Press). Davi Walders, Women Against Tyranny: Poems of Resistance During the Holocaust (Clemson University Digital Press). Hot Sonnets, ed. Moira Egan and Clarinda Harriss. Contributors include: Kim Addonizio, Sandra Beasley, David Bergman, Grace Cavalieri, Tim Dlugos. (anthology, Entasis Press). Milk and Honey: A Celebration of Jewish Lesbian Poetry, ed. Julie R. Enszer. Contributors include: Joanna Hoffman, Eryca Kasse, Eleanor Levine, Bonnie J. Morris, Jess Novak. (anthology, A Midsummer Night’s Press). Writers Among Us: A Celebrtion of St. Albans School’s Writer-in-Residence Program. Contributors: Christopher Feliciano Arnold, Lora Jane Berg, Will Blythe, Beth Boyett, Katie Brandi, Stuart Holmes Coleman, Bernardine Connelly, Cynthia Cotts, Ronica (Bhattacharya) Dhar, Caitlin Doyle, James Hoch, David Kajganich, Matthew Klam, Kimberly Libby, Robert Lunday, Margaret Meyers, Michael Pickard, Hannah Louise Poston, Brendan Short, Shauna Seliy, Curtis Sittenfeld, Brian Weinberg, Holly Richards Woodward, Christy J. Zink, and Mary Kay Zuravleff. (mixed genre anthology, St. Albans Press). Sylvia Dianne Beverly, Cooking Up South (Capital BookFest). Cookbook, with poems about food. Contributors include: Shirley J. Brewer, Tinesha Davis, Nikki Giovanni, Deanna Nikaido, Kim Roberts. Al pie de la Casa Blanca: Poetas Hispanos de Washington DC, edited by Luis Alberto Ambroggio and Carlos Parada Ayala. Contributors include: Francisco Aragón, Quique Avilés, Naomi Ayala, Rei Berroa, Robert Giron, Gladys Ilarregui, Samuel Miranda, Martha Sanchez-Lowery. (anthology in Spanish, Academia Norteamericana de la Lengua Española). The Poet’s Cookbook: Recipes from Germany, ed. Grace Cavalieri and Sabine Pascarelli. Poems by 33 American Poets with German Translations, plus recipes. Contributors include: Karren L. Alenier, Naomi Ayala, Anne Becker, Cliff Bernier, Christina Daub, Nan Fry, Patricia Gray, Dolores Kendrick, Merrill Leffler, Elisabeth Murawski, Jean Nordhaus, Linda Pastan, Ernie Wormwood, Ed Zahniser. (Forest Woods Media Productions). Dee Snyder’s Open Mics: Rantings and Writings, ed. Dee Snyder (chapbook, Dee Snyder). Contributors include: Ann Brandstadter, Eric Hendrixson, Russell Henry, Donald Illich, HH Judd, Tony Masalonis, J.D. Smith, Marisa Torrieri. Inventory, ed. Barbara Goldberg. Contributors include Reed Whittemore, Cicely Angleton, and Elaine Magarrell. (Barclay Bryan Press). Letters to the World: Poems from the WOMPO Listserv, ed. Moira Richards, Rosemary Starace, and Lesley Wheeler. Contributors include: Kimberly L. Becker, Nancy Naomi Carlson, Julie R. Enszer, Bernadette Geyer, D.O. Moore, Elizabeth Rees, Kim Roberts, Patricia Valdata, Diane Vance, Brandy Whitlock, Rosemary Winslow (Red Hen Press). Self Portrait: Poems from the Soul of the City. Poems by 21 poets enrolled in DC high schools who participated in the 2008 Soul of the City youth leadership program. Foreward by Joy Ford Austin. (Humanities Council of Washington, DC). The Bedside Guide to No Tell Motel – Second Floor, ed. Reb Livingston and Molly Arden. Contributors include: Deborah Ager, Sandra Beasley, Jill Alexanxder Essbaum, Julie R. Enszer, Piotr Gwiazda, Donald Illich, Cheryl Pallant, Shann Palmer, Kim Roberts, Carly Sachs (No Tell Books). Best New Poets 2006: 50 Poems from Emerging Writers, ed. Eric Pankey (University of Virginia Press). Cut Loose the Body: An Anthology of Poems on Torture and Fernando Botero’s Abu Ghraib Paintings, ed. Rose Berger and Joseph Ross. Contributors include Myra Sklarew, Kyle Dargan, E. Ethelbert Miller, Consuelo Hernandez, Tala A. Rameh (chapbook, American University Museum and DC Poets Against the War). Electric Grace: Still More Fiction by Washington Area Women, ed. Richard Peabody. Contributors include: Maxine Clair, Rosie Dempsey, Jamie Holland, Eugenia SunHee Kim, Joanne Leedom-Ackerman, Faye Moskowitz, Jessica Neely, Sheila Walsh, Christy J. Zink (short fiction anthology, Paycock Press). Buck Downs, In Memory D Thompson (limited edition, Buck Downs). A series of poems composed of rubbings taken from headstones in Congressional Cemetery, DC. JoAnne Growney, My Dance is Mathematics (chapbook, Paper Kite Press). American War Poetry, ed. Lorrie Goldensohn. Contributors include: Joel Barlow, Ambrose Bierce, Elizabeth Bishop, Joseph Brodsky, Paul Laurence Dunbar, Carolyn Forché, Charlotte L. Forten Grimké, Anthony Hecht, Langston Hughes, Randall Jarrell, Francis Scott Key, Robert Lowell, Archibald MacLeish, Joaquin Miller, Ezra Pound, Walt Whitman. (Columbia University Press). Nancy Naomi Carlson, Imperfect Seal of Lips (chapbook, winner of the Tennessee Chapbook Prize, published in Poems & Plays, Issue 12). Nap Turner, Nap Turner Presents Hughes’ View of the Blues. The acclaimed WPFW-FM deejay reading Langston Hughes‘s Jesse B. Semple stories (CD, Right on Rhythm). Joy C. West, Dancing on the Fringes of the Realm (chapbook, Joy C. West). Alice Redux: New Stories of Alice, Lewis, and Wonderland, ed. Richard Peabody (fiction anthology, Paycock Press). 180 More: Extraordinary Poems for Every Day, ed. Billy Collins. Contributors include Christina Daub, Anthony Hecht, Edward Hirsch, Ted Kooser, Linda Pastan (Random House). Poetic Voices Without Borders, ed. Robert L. Giron. Contributors include Karren L. Alenier, Luis Alberto Ambroggio, Rei Berroa, Jody Bolz, Grace Cavalieri, Piotr Gwiazda, Suzan Shown Harjo, Peter Klappert, C.M. Mayo, Judith McCombs, E. Ethelbert Miller, Richard Peabody, Kim Roberts, Myra Sklarew, Hilary Tham, Davi Walders and Ernie Wormwood (Gival Press). Poetry Alive at Iota: 10th Anniversary CD, ed. Terence Mulligan, Martha Sanchez-Lowery and Miles David Moore. Featured authors include: Karren L. Alenier, Dean Blehert, Grace Cavalieri, Sunil Freeman, Patricia Gray, Reuben Jackson, Hiram Larew, Judith McCombs, Richard Peabody, Kim Roberts, Hilary Tham (CD anthology, Minimus Productions). DC Slam Semi-Finals 2004, SLAMicide (Baltimore) Semi-Finals, and the DC/Baltimore Slam Team Finals Night 2004; available on DVD separately or as a 3-disc box set. Sheets for Men Only: International anthology of poetry and prose, ed. Claire Kincannon. 25 contributors from 12 countries, including E. Ethelbert Miller, Steve Scafidi, Henry Taylor (Dancingink Press). 31 Arlington Poets, ed. Richard Peabody. Contributors include: Karren L. Alenier, Rei Berroa, John Elsberg, Miles David Moore, Kim Roberts, Martha Sanchez-Lowery, M.A. Schaffner, Hilary Tham ( CD anthology; Paycock Press). Women in the Avant Garde: Laura Elrich, Heather Fuller, Carol Mrakove, Kristin Prevallet, and Deborah Richards (CD anthology, Narrow House Recordings). Elizabeth Alexander, The Black Interior: Essays (nonfiction, Graywolf Press). Tonya “JaHipster” Matthews, The Legend of Afrodite (CD, JaHipster). Common Wealth: Contemporary Poets of Virginia. ed. Sarah Kennedy and R.T. Smith. Contributors include: Jennifer Atkinson, Peter Klappert, Eric Pankey, Henry Taylor (University of Virginia Press). The Healing Fountain: Poetry Therapy for Life’s Journey, ed. Geri Chavis and Lila Weisberger (anthology of essays and poems, National Assn. for Poetry Therapy). The Road Less Taken: The St. Valentine Sunday Poetry Marathon 2001, ed. Chezia Thompson Cager and Blair Ewing. Includes Ron D. Baker, Hiram Larew, Nicki Miller, Richard Peabody (CD anthology, Maryland Institute College of Art). Maxine Combs, Listening for Wings (Wineberry Press). An Eye for an Eye Makes the World Blind: Poets on 9/11, ed. Allen Cohen, Clive Matson, and Michael Parenti. Includes Grace Cavalieri, Lyn Lifshin, Robert Pinsky (Regent Press). When Words Became Flesh, ed. Myisha Cherry. Includes Fahim Nassar, Giovanni, Rush, The Dri Fish, Makeda Crane, Takisha, Komplex (Mwaza Publications). The Gargoyle CDs. CD #1, recorded in 1986, includes John Elsberg, Tina Fulker, Gretchen Johnsen, Dan Johnson. CD #2, also recorded in 1986, includes Nigel Hinshelwood, Beth Joselow, Sharon Morgenthaler, Michael S. Weaver. CD #3, 1987, includes Maxine Clair, Reuben Jackson, Sibbie O’Sullivan. CD #4, 1989, includes Elizabeth Oness, Joe Ross, Catherine Harnett Shaw, Hilary Tham. (CD, Gargoyle). In a Certain Place, ed. Carolyn Kreiter-Foronda and Alice Marie Tarnowski. Anthology published in memory of Betty Parry, includes Charles Sullivan, Judith McCombs, Elisabeth Stevens, Stacy Tuthill (SCOP Publications). Weavings 2000: The Maryland Millenial Anthology, ed. Michael S. Glaser. Includes Karren LaLonde Alenier, David Bergman, Jody Bolz, Sterling Brown, Kenneth Carroll, Grace Cavalieri, Maxine Clair, Michael Collier, Christina Daub, Roland Flint, Sunil Freeman, Nan Fry, Clarinda Harriss, Reuben Jackson, Philip K. Jason, Rod Jellema, Jean Johnson, Ann Knox, Danuta Kosk-Kosicka, Judith McCombs, Hiram Larew, Merrill Leffler, E. Ethelbert Miller, Jean Nordhaus, Linda Pastan, Ilona Popper, D.J. Renegade, Elisavietta Ritchie, Myra Sklarew, Elizabeth Spires, Henry Taylor, Hilary Tham, Reed Whittemore, Terence Winch (Forest Woods Media Productions).